Our clients are in love with their labradoodle.... their first baby! We wanted to incorporate her into the room and make sure she was included. Every detail was thought through with the expecting couple in mind. 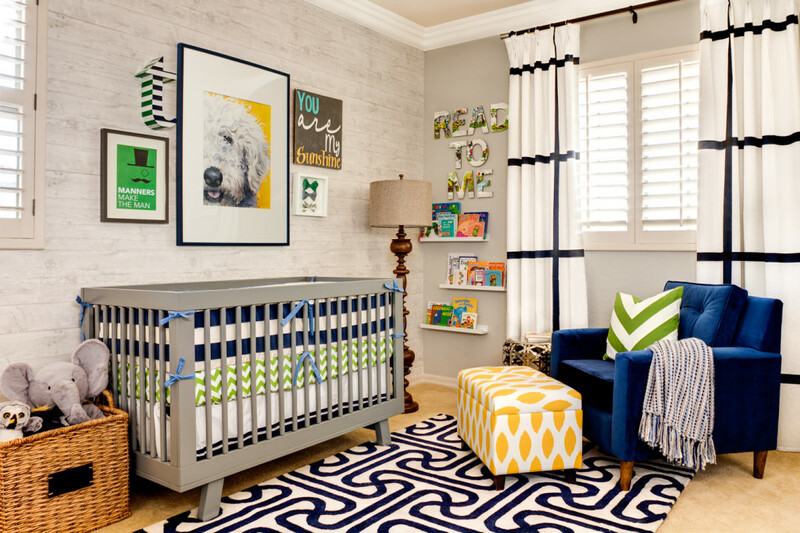 We wanted to make their little one feel comfortable in an environment that reflected his parents. The main inspiration for the room was the labradoodle print. Our favorite item in the room is the vintage story book letters "Read To Me"
I like the green dresser, the READ TO ME story book letters, the giraffe wall lamps, and the labradoodle print. Such a lovely nursery. Interesting rug. What kind of pattern is that? Where can I find those cute lamps? I didn’t see them on your website. This room is so new that we haven’t added all the items to our shop yet:( please feel free to contact us at [email protected] and we can place an order for you! We can order them for you! Please contact us at [email protected] for more info! Love the nursery decor. Where is the labradoodle print from? can you post what paint color is on the dresser? what about fabric color on the chair? They are both stunning! Where can I find this wallpaper, love it! What vintage book is used on the “Read to Me” wall art?